Christian advocate of the emancipation of the Jews; born June 22, 1770, in the village of Radis, near Wittenberg, Prussia; died at Leipsic Jan. 12, 1842. He was lecturer at the University of Wittenberg (1794-1801), and professor of philosophy at the universities of Frankfort-on-the-Oder (1801-4), Königsberg (1805-9), where he succeeded Kant, and Leipsic (1809 until his death). Krug wrote a great number of books, essays, and dissertations. In his autobiography, "Lebensreise, in Sechs Stationen Beschrieben" (Leipsic, 1825), published under the pseudonym "Urceus," and reissued in 1842 under his own name, he gives a list of 189 of his writings. He was a warm defender of political and religious liberty. 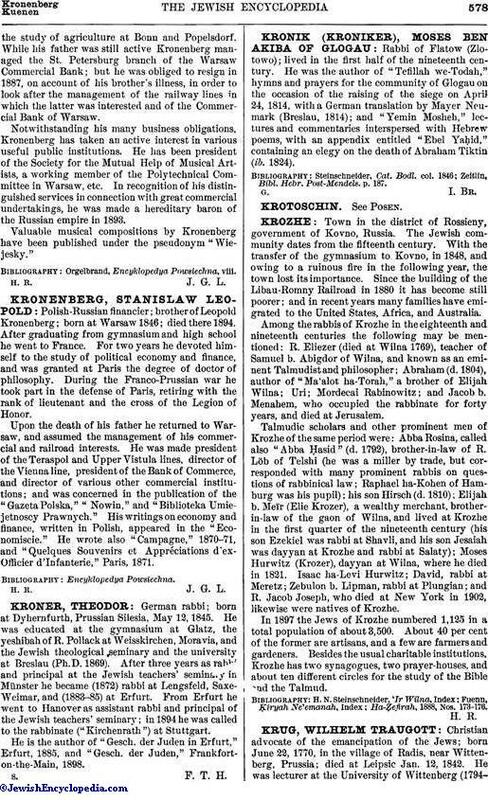 Having in 1819, in his "Eusebiologie oder Philosophische Religionslehre," spoken highly of the Jews and Judaism, he pleaded for their emancipation in a pamphlet which was entitled "Ueber das Verhältniss Verschiedener Religionsparteien zum Staate und über die Emancipation der Juden" (1828). In 1830 a new constitution was proposed for Saxony, which contained the provision that "To every inhabitant of the kingdom are granted liberty of conscience and protection in the exercise of his religious duties." But in another paragraph this liberty was restricted to Christians, it being stated that "diversity of the Christian denominations shall be no impediment to the enjoyment of civil and political rights." 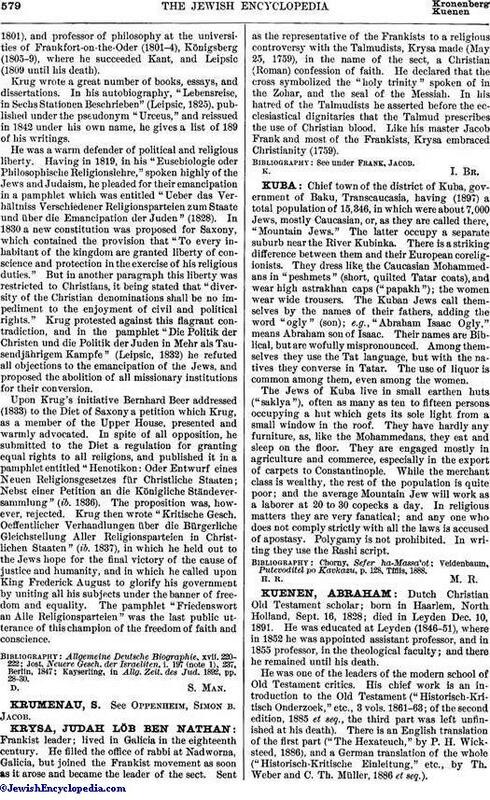 Krug protested against this flagrant contradiction, and in the pamphlet "Die Politik der Christen und die Politik der Juden in Mehr als Tausendjährigem Kampfe" (Leipsic, 1832) he refuted all objections to the emancipation of the Jews, and proposed the abolition of all missionary institutions for their conversion. Upon Krug's initiative Bernhard Beer addressed (1833) to the Diet of Saxony a petition which Krug, as a member of the Upper House, presented and warmly advocated. In spite of all opposition, he submitted to the Diet a regulation for granting equal rights to all religions, and published it in a pamphlet entitled "Henotikon: Oder Entwurf eines Neuen Religionsgesetzes für Christliche Staaten; Nebst einer Petition an die Königliche Ständeversammlung" (ib. 1836). The proposition was, however, rejected. Krug then wrote "Kritische Gesch. Oeffentlicher Verhandlungen über die Bürgerliche Gleichstellung Aller Religionsparteien in Christlichen Staaten" (ib. 1837), in which he held out to the Jews hope for the final victory of the cause of justice and humanity, and in which he called upon King Frederick August to glorify his government by uniting all his subjects under the banner of freedom and equality. The pamphlet "Friedenswort an Alle Religionsparteien" was the last public utterance of this champion of the freedom of faith and conscience. Kayserling, in Allg. Zeit. des Jud. 1892, pp. 28-30.